Would you like to have a simple tool that you can use anywhere to determine whether something is good or bad for you? Well, today’s edition of the Empowered Spirit News focuses on providing you with a simple tool that can be used for checking a variety of things such as the strength of your beliefs or whether a supplement or food is right for you and many other things as well. In the next issue I will share with you a simple way to utilize this method for checking to determine whether your Chakra’s are opened or shutdown. Applied Kinesiology is a method of checking the truth about a particular statement, belief, or thing. There is much research to support the use of applied kinesiology (AK), also known as muscle checking. For example, one person gave his audience envelopes that had either pure organic vitamin C powder or aspartame in them. He instructed the group on the use of applied kinesiology and suggested that each person hold the envelope to their solar plexus and check the strength of their arm by using AK with a partner. The result was that 100% of the people who had the vitamin C stayed strong and 100% of the people who had the aspartame became weak. The following are two different methods of applied kinesiology that you can use on yourself. Before doing AK, it is important that your energy is “clear” in order to get accurate answers. If you have been drinking alcohol or using drugs that affect your senses, the answers you get will not be accurate. I highly recommend that you wait to do any AK checking until you are clear of these substances. Additionally, it is important that the body is properly hydrated when doing AK checking. If you are dehydrated, the results of the AK checking may be inaccurate. Caffeine dehydrates the body and should not be used when doing AK checking. I highly recommend that you drink some water before getting started and that you sip water occasionally while doing AK checking. 2. Place the tip of your tongue so that it is on the roof of your mouth just behind your front teeth. 3. Place the tip of your index finger and thumb together and form a circle as shown in figure . 4. 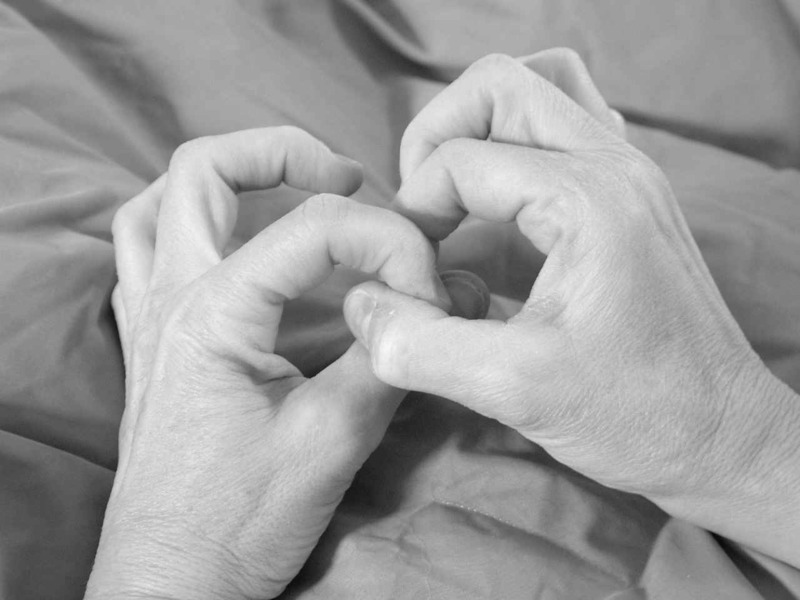 Loop the index finger of the opposite hand through the circle created in step 2 above and touch the tip of that finger to the thumb of the same hand forming a chain effect as shown in Figure 2. 6. Then attempt to pull the chain apart by pulling one of the circles against the opening of the other. b. If you are able to pull the fingers apart (as shown in figure 4) the answer is no. 7. To verify that this method works for you do the following check. b. Using the method above, check to see that the loop stays strong. d. Using the method above check to see that the loop is weak since it is not your name. 8. If this works for you then you can check other things as well with this method. If you find that this method of applied kinesiology doesn’t work for you or if you would like to view other methods please feel free to click on the link below to obtain information about the six methods of Self Administered Applied Kinesiology that I teach. For the next week practice using Applied Kinesiology on a variety of things. Remember to always use the ‘Chakra Opening and Balancing Symbol” and make sure your body is hydrated prior to doing the applied kinesiology checking. For example, you may want to determine whether a particular food or supplements if taken by you is in your highest good, or you may want to test the strength of one of your beliefs to determine whether it is true or false. To check a supplement, place the supplement against your body near your solar plexus. The solar plexus is located in the soft spot at the bottom of your breast bone. Holding the item at your solar plexus make the following statement: ‘Taking this supplement is in my highest good,’ then using applied kinesiology check to see if the statement holds strong or goes weak. If it is strong the supplement is in your highest good to take, if it is weak the supplement is something you probably do not need to take. If you are taking other supplements it is recommended that you check the new supplement in conjunction with everything else you are taking. The supplement by itself may be strong for you, but with your others supplements it may be weak, this can be caused for a variety of reasons, such as a duplication of ingredients that would give you too much of that ingredient, or something in one supplement may negate the ingredients in the other supplement. Test supplements individually then create combinations and test them to determine whether they work together. For testing food, visualize or look at the food that you are considering and make the statement ‘Eating this (name the food) is in my highest good and my bodies highest good,’ then check the strength of the statement using applied kinesiology. You can also check your belief statements by making the statement and checking to see if the statement holds strong or goes weak. In case you have misplaced you ‘Chakra Opening & Balancing symbol I have included another copy at the end of this newsletter. No part of this newsletter may be reproduced by any mechanical, photographic, or electronic process, or in the form of a phonographic recording, nor may it be stored in a retrieval system, transmitted, or otherwise copied for public or private use without written permission of the author. This newsletter is designed to provide information regarding the author’s experience utilizing the included symbols to shift energy within her body for the purposes of healing herself. Information provided also includes the experiences of others who have utilized this work. This work is not intended to be used for the purposes of diagnosing or curing/healing any ailment and is experimental in nature. The work is also not intended to take the place of any medical doctor’s advice or treatment. The author does not dispense medical advice; nor does she prescribe the use of any technique as a form of treatment for medical problems without the advice of a physician, either directly or indirectly. The intention in providing the information included in this newsletter is only to offer information of a general nature to help you cooperate with your licensed doctor/medical practitioner in your quest for health. In the event that you use any of the information in this newsletter, you are responsible for prescribing for yourself, which is your constitutional right, but the author assumes no responsibility for your actions.